John Bernard Feit leaves the 92nd state District Court during a break in Feit's trial for the murder of Irene Garza Thursday, Nov. 30, 2017, at the Hidalgo County Courthouse in Edinburg. 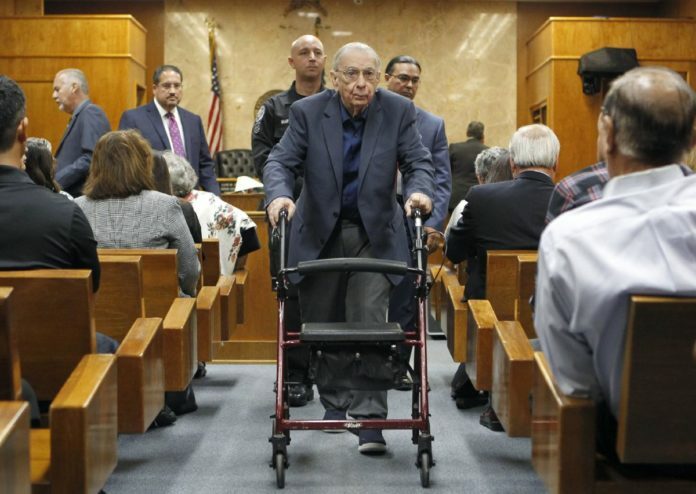 EDINBURG — A reporter-turned-attorney testified Thursday that John Feit, the ex-priest accused of suffocating schoolteacher and beauty queen Irene Garza in April 1960, remained free for more than half a century thanks to a coverup brokered by two of the region’s more influential institutions at that time. The testimony came on the first day in court of the long-awaited murder trial, in which both the prosecution and defense breezed through their opening statements before the judge and jury. Prosecutors argued that Feit, 85, enjoyed five decades of freedom thanks to a deal struck between the defendant, the Catholic Church and then-Hidalgo County District Attorney Robert Lattimore. Feit, who was arrested in February 2016, now faces a murder charge in the Garza cold case. “You’re going to learn (that) the institution who was in the business of seeking salvation for others was complicit in covering up this murder,” Assistant District Attorney Michael Garza said during his opening statement. Defense attorney O. Rene Flores, however, told jurors during his opening statement that there were no witnesses who saw his client with Garza on April 16, 1960 — the night she disappeared. When her body was discovered days later in a McAllen canal, Flores said there was no forensic evidence that “affirmatively linked” the then-27-year-old visiting priest to her death. “There’s a difference between a story and a fact,” Flores said, alluding to the national media attention the case has attracted. This included TV specials which have speculated on the fate of the former Miss South Texas, a devout Catholic who died at the age of 25. McAllen attorney Darrell Davis, a former Channel 5 reporter who covered the case in 1960, provided his own insight during testimony, alleging that Hidalgo County authorities — most of whom Catholic — were involved in backroom deals with Feit’s supervisors. This, the prosecution argued, led investigators to stop pursuing Feit as the primary suspect in Garza’s murder. The district attorney’s office was pursuing another case against Feit at the time — Maria America Guerra’s aggravated assault. Weeks before Garza’s disappearance, Guerra, then a college student, told law enforcement authorities that Feit attacked her at an Edinburg church. Davis testified that Lattimore invited local media to an off-the-record meeting in which he informed reporters that Feit would plead no contest in the Guerra attack and the state would drop the Garza case. No contest is a plea in which a defendant does not contest the charge but does not admit guilt. The Guerra case, which was tried in Austin, had resulted in a hung jury, and hence a mistrial. “(Lattimore) knew that Father Feit killed Irene and the church knew it,” he testified. Flores objected to Davis’ testimony regarding the Lattimore meeting being presented to the jury, arguing that it would lead jurors to believe a plea agreement had been reached between his client and the district attorney’s office when no record of as much existed. State District Judge Luis Singleterry overruled the defense’s objection, explaining that from his perspective, a plea agreement was not reached in 1962. After Davis was released from the stand Thursday afternoon, the other five witnesses called to testify on the trial’s first day continued to tell the story of a young woman whose life was cut short. They also fulfilled the prosecution’s promise to take the jurors, all of whom appear to be relatively young, back to the 1960s. Garza’s godsister told jurors of the night the woman she idolized did not come home from her evening confession, and the Irish pastor who directed her church group spoke about the woman he described as “an extremely good person” who adored her parents and older sister and the elementary school children she taught. A family friend testified about discovering Garza’s purse on the side of a roadway days after her death. This is the same purse her then-second grade student testified about bringing to Feit after finding it in the confessional line. A woman who lived across from the canal where Garza’s body was discovered also testified to hearing a strong “crushing” noise outside her house the night she disappeared. “There wasn’t enough evidence then; there won’t be enough evidence now,” Flores said during his opening statement. More witnesses will be called to the stand Friday as the trial enters its second day.